But to have flavourful chicken juices, I must get a good chicken. I bought half a Naked Neck, locally known as "gong geng gai" in Cantonese, or you can get a "woo sou gai" of which I don't know the proper English name for this bearded chicken. but both chicken breeds are known to have better meat than regular farmed chickens. I made 8 parcels. My girls each had one and they thoroughly enjoyed dinner, and even complimented me verbally, LOL. My boy took half and my hubby and I walloped the rest. Served with some acar of which.I find, ruined the whole thing because the rice has such a delicate flavour. I totally loved how the rice taste and smells like. But if you prefer strong flavours, you might find this..... bland. Now, I want to give myself a pat on the back. I cooked rice on the stove top in a pot without burning, LOL. I have always marveled at people who could do that. Finally I could. Well, you don't have to do it like me. You can use a rice cooker, something of which I don't have. And for once, I want to challenge myself not to use the microwave. :-) Just render some fat from the chicken before you cook the rice in your rice cooker and it will taste marvelous. 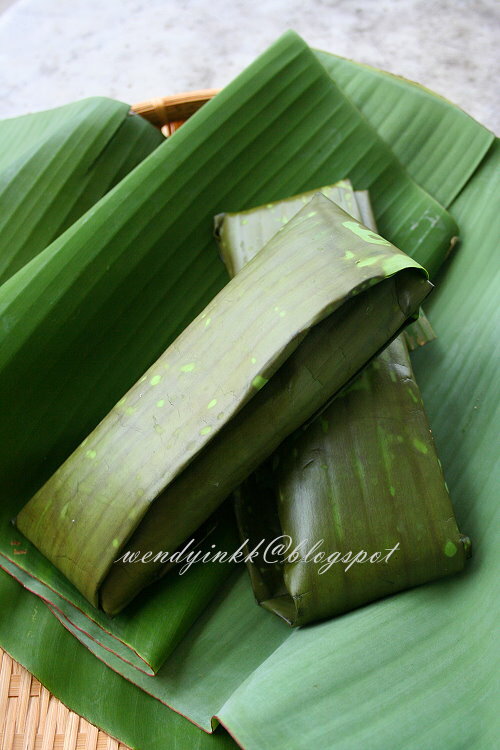 I can't get simpur or tarap leaves here, and so I had to make do with banana leaves. 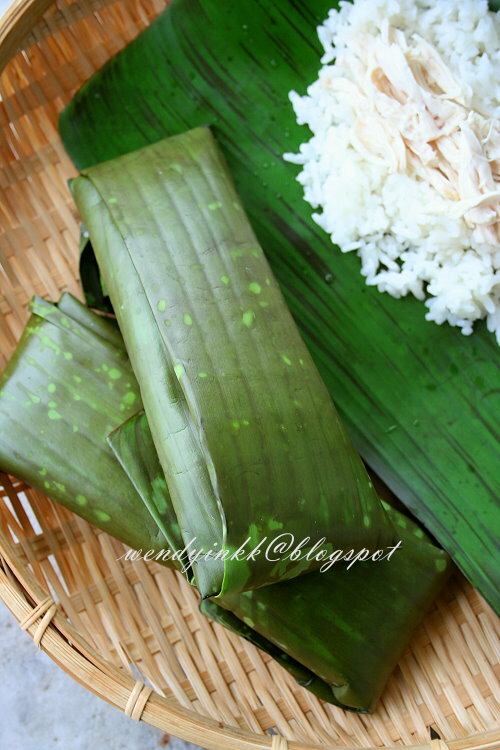 If you have always preferred banana leaf wrapped nasi lemak, I think you will enjoy this special simple chicken rice too. 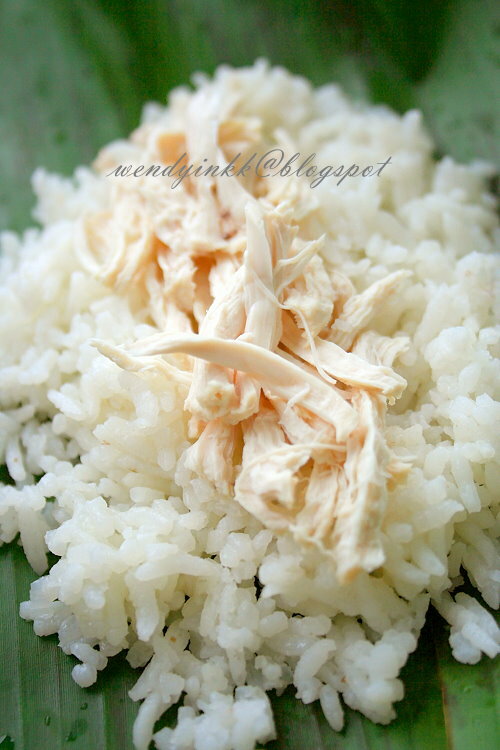 The leaves add a new dimension to the good old chicken rice that we are so familiar with. 1. Soak rice for at least 30 minutes. 3. Drain the rice and put it in the simmering chicken broth. 4. Let the rice boil on medium heat (lid off) until you no longer see any extra liquid floating on top. 5. Turn the heat down to the lowest and let it cook for another 10 minutes or so, until the rice is cooked. 6. Turn off the heat and let the rice sit for another 30 minutes. 8. 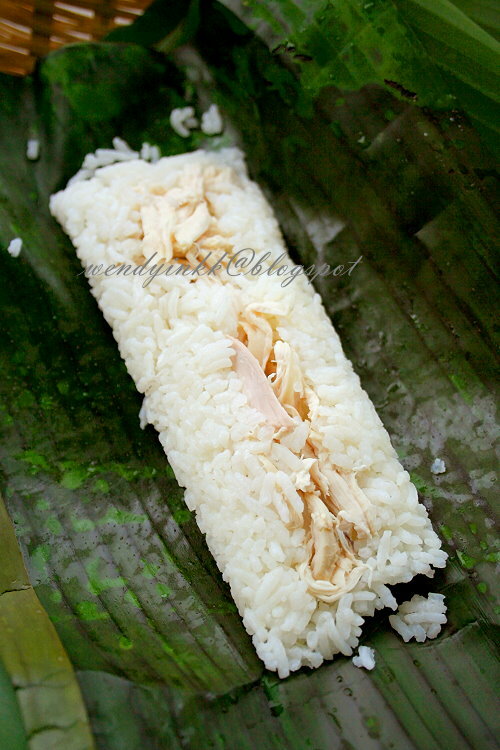 Spoon a few Tbsp of warm rice onto banana leaf, top with some chicken shreds and fold like a parcel. ** Stir rice once only, that is after putting in at step 3. 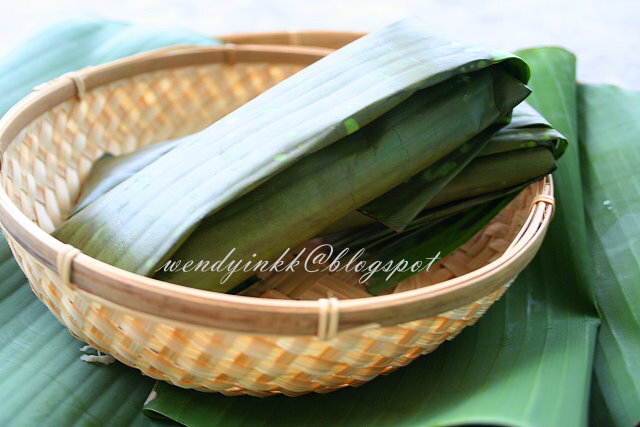 ***Parcels can be reheated by steaming, of which adds more banana leaf fragrance to the rice. Do your part as a citizen of Malaysia. Will cook this and let you know how it turns out... Good for picnic! :) You are so... genius wendy! Wow, this looks so wholesome and good! Yes, it's important to get a nice flavourful chicken for this dish. May I ask why you don't own a rice cooker? I understand they can take up a lot of space, and if you get good results from the microwave maybe you don't need one. It's just that I cannot live without mine, and wonder how resourceful people like yourself make such great rice without a cooker! Not my brainchild ler... hehehe. I wanted to get one, but maybe a bit lazy to go get one, but have been surviving for years without one... more than 10? ?